Six Word Saturday- Spring Break! Spring Break! Snowshoeing, camping, shivering, ROMO! Yup, we've decided to go snowshoeing and camping up at Rocky Mountain National Park for the weekend :) It's a very rare weekend that I am not on call, and since this is one of them, we're peacing out for a couple days. Not to worry - it's car camping so there will be lots of down blankets in our tent, and I'll come back with pictures, I promise! Between writing and doing my 'real' job, I've been reading. I know, crazy right? A writer who reads. You'd never think! My focus the last couple of weeks, has been reading about social media and how to maximize our presence for building a 'platform' and hopefully selling books. The most interesting thing I've found is Kristen Lamb's We Are Not Alone method of connecting with people. I've been reading her book, Rise of the Machines -- Human Authors in a Digital World. It's a bit basic at moments - like when she, for example, defines a Tweet - but some of the concepts she talks about hit on truths that I'd been intuiting but hadn't quite solidified as a concept. One of those is that writers on social media seem to primarily socialize with other writers, which is not a particularly effective way to sell books. Now, I recognize the irony of talking about this on IWSG day, I do. But bear with me! She says that it's good to do some socializing with writers, because of course fellow writers are the only ones who understand this particular brand of craziness and we need to have people on our side (hence, IWSG). 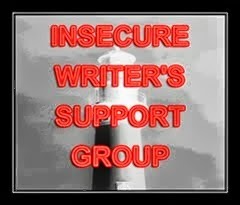 But in order to build a true base of supporters that will sell books, it is necessary to connect with people who are NOT writers, or even necessarily "avid readers". Think about all those people on Twitter who claim to have a huge base of "avid readers" as followers. Have you looked at the list? It's mostly all our writing friends! The goal is to connect on social media with everyone else, in hopes that they will share the awesome'ness of your book with their friends, and help you go viral. A great example of this is Alex J Cavanaugh's recent success with his book CassaFire. The man is everywhere in the blogosphere and is a super nice guy, so when he asked for help promoting, people stepped up. And he sold TONS of books. Success! Part of how to accomplish this is to let people see you as a person, not just as a writer. You also have to show that you appreciate them as people, in return. It makes sense, right? When blogging or tweeting, if we're only posting about writing all the time, most folks aren't going to connect with that. But if we share our thoughts on the big game, or our favorite recipes, or cat pictures, or the beautiful places we've been, that is what captures the attention of the general population. It hits them in their heart, which is most likely what we aim to do with our books as well. We are storytellers, so we must tell stories to connect with our audience. All this to say that in the midst of trying to finish book number two, I've also been considering a pretty major redirection in how I use social media. First things first, we need to finish Sky Pirates, but it's a lot to think about! Very interesting to think about, but a lot nonetheless. How do you use social media? Are most of your friends/followers writers, or everyone else? Any success (or fail) stories to share? We are watching the movie Kon Tiki (well, I'm half-watching while I write) and Chris says that the next time I've had a really rough day at work, I need to think about that movie and be thankful that I wasn't covered in blood and swimming in the ocean surrounded by sharks. Reassuring!